Now I’m a bit of gadget animal and I’ve had a Garmin GPS for some years but recently spurred on by improvements in the sensitivity of the units I updated my Garmin from a Etrex Venture to an Edge 205. One of the reasons is that you can get the Edge 205 for about £80 on eBay if you pick a seller who plays the currency markets. I reckon the Edge 305 is the more popular model as it has the options for heart monitor and cadence sensor but I decided my Polar HRM was sufficient for that! In use the Edge 205 is more sensitive than the Etrex Venture and manages to hold onto the signal even under trees which is a big improvement. I recently took the Garmin Edge on holiday to Ireland, and using a rented car from car hire ireland managed to navigate perfectly with it, even in areas where the signal could be a bit weak, so it’s a definite improvement over models like the Etrex. Accuracy can still drop but on the mini epic of a ride we did last Sunday it managed to track the course pretty well with no more than a 10m error at worst. Given the data in the GPS all that remains is to plug it into the PC where the Garmin training centre immediately pops up and downloads the latest info. The screenshot shows a small map and under that is a graph showing elevation on one plot and speed on the other. Standard GPS are not as accurate in the vertical plane as they are in the horizontal. This can be seen when you import the track into something like Tracklogs where there is an option to use either the GPS elevation data or the elevation data built into the OS map. Anyway, in my experience, up is still up and down is down so that’s pretty much all I’m worried about! The Edge 205 comes with two mounts, one for handle bar mounting and one for stem or top tube mounting, additional mounts are available so each of my bikes now has a mount. The unit is powered by a lithium battery that is built in. The charger was a US plug version but the unit charges very well from a USB2 socket so that didn’t bother me either. Being more of a training device than a navigational device this unit also gives you an idea of how many calories you’ve burnt off in the ride which is great when you are chomping away on flap jack! Having said that it is still easy to put a route into the unit follow it. Overall it’s a great little unit and if you like gadgets then it’ll keep you amused for a few months, especially if you get the superb tracklogs software. Tracklogs allows you to follow the route on either a 1:25000 or 1:50000 scale Ordance Survey map. The map can either be viewed flat or contoured using the elevation data and it will display the route you have done in 3D if you wish. Take a look at www.tracklogs.co.uk for more details. 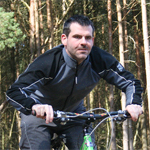 Dave's been riding seriously since about 1997 and is one of the founding Molefathers — along with Matt and Mark — that came up with the idea of a MTB website for Mole Valley riders. He's had several different bikes but it's now mainly 29ers in Dave's stable, apart from an Orange 5. Cheers for this review Dave, was lookin at a 305 but figured I prolly won’t wear the HR thing anyway so wtp! Happy new year, have a great 2010 !! !